Sorry... the 2017 Toyota Camry Hybrid is no longer being sold as new. Instead, take the first step to a great deal on 2019 Toyota Camry Hybrid with a free price quote! 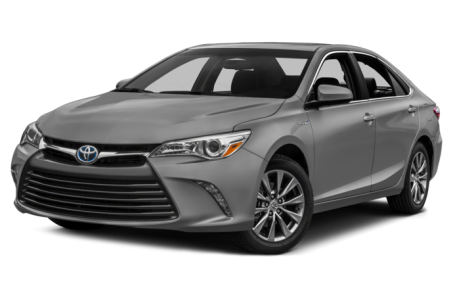 The 2017 Toyota Camry Hybrid is the more fuel efficient version of the popular midsize family sedan. It competes with the Ford Fusion Hybrid, Hyundai Sonata Hybrid, and Kia Optima Hybrid. The Camry Hybrid can switch to normal, EV (electric), and Eco driving modes. The battery pack is mounted between the rear seats and trunk. Three trim are available: the LE, SE, and XLE. The Camry Hybrid has the typical characteristics of a plain, family-car with exception to its massive front grille, which take design cues from the Lexus lineup. Standard features include power/heated side mirrors and power windows/locks. Available features include LED daytime running lights, a sport mesh front grille, a power moonroof, sport-tuned suspension, and a rear spoiler. Under the hood, the Camry Hybrid has a net 200-hp, 2.5-liter 4-cylinder engine with an electric motor mated to an electronically controlled, continuously variable automatic transmission (ECVT). Fuel economy for the LE is an EPA-estimated 42/38 mpg city/highway. The rating slightly dips to a 40/37 mpg for the SE and XLE trims. Inside, the Camry Hybrid has a cloth-fabric interior with a multi-information display at the center console. It also features a standard audio system with CD/MP3 playback, Bluetooth connectivity for phone and audio, Siri Eyes Free mode, and a USB port. It can be upgraded to the Entune Audio Plus multimedia system, which includes a 7-inch touchscreen, an integrated navigation system, a satellite radio, and a JBL premium audio system. Standard features include dual-zone automatic climate control, remote keyless entry, push-button start, and a power driver seat. Available features include leather-trim seating, leather-trim steering wheel, heated front seats, a power passenger seat, an automatic dimming rearview mirror, adaptive cruise control, and a wireless smartphone charging station. The Camry Hybrid earned a full 5-star overall crash test safety rating from the National Highway Traffic Safety Administration (NHTSA). Standard safety features include a backup camera and a tire pressure monitoring system. The optional Safety Connect emergency communication system offers a subscription to services such as emergency assistance, stolen vehicle locator, roadside assistance, and automatic collision notification. Other available features include a blindspot monitoring system and rear cross traffic alert. 19 of 20 (95%) consumers said they would recommend this vehicle to a friend.